Liver disorders are common and often chronic. They represent a growing public health burden for a number of reasons: a) Unexpected drug-induced liver injury (DILI) is a major reason that otherwise effective therapies are removed from the market; b) Hepatocellular carcinoma (HCC) is the fifth most common cancer globally, with a high mortality to incidence ratio; and c) Organ shortage is one of the major challenges in liver transplantation and ultimately leads to significant mortality due to long waiting lists. Today many researchers are focused on finding better imaging techniques to evaluate liver disorders and therapies. 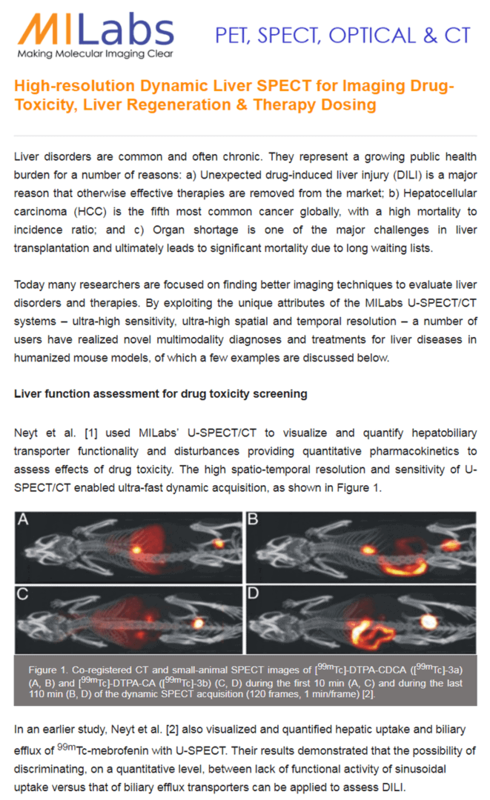 By exploiting the unique attributes of the MILabs U-SPECT/CT systems – ultra-high sensitivity, ultra-high spatial and temporal resolution – a number of users have realized novel multimodality diagnoses and treatments for liver diseases in humanized mouse models, of which a few examples are discussed below. Neyt et al. used MILabs’ U-SPECT/CT to visualize and quantify hepatobiliary transporter functionality and disturbances providing quantitative pharmacokinetics to assess effects of drug toxicity. The high spatio-temporal resolution and sensitivity of U-SPECT/CT enabled ultra-fast dynamic acquisition, as shown in Figure 1. Figure 1. Co-registered CT and small-animal SPECT images of [99mTc]-DTPA-CDCA ([99mTc]-3a) (A, B) and [99mTc]-DTPA-CA ([99mTc]-3b) (C, D) during the first 10 min (A, C) and during the last 110 min (B, D) of the dynamic SPECT acquisition (120 frames, 1 min/frame) . In an earlier study, Neyt et al. also visualized and quantified hepatic uptake and biliary efflux of 99mTc-mebrofenin with U-SPECT. Their results demonstrated that the possibility of discriminating, on a quantitative level, between lack of functional activity of sinusoidal uptake versus that of biliary efflux transporters can be applied to assess DILI. As DILI is a potentially fatal adverse event and because there is a shortage of liver donors, researchers have started studying cell therapy for liver regeneration as a potential alternative. Hickey et al. at Mayo Clinic demonstrated the usage of MILabs SPECT for quantitative longitudinal monitoring of tissue regeneration over time in a mouse model with transplanted hepatocytes expressing sodium iodine symporter (NIS) . The high resolution and sensitivity of U-SPECT enabled them, for the first time, to accurately visualize and quantificate transplanted cells and their distribution in the liver and individual regenerating nodules, as shown in Figure 2. Figure 2. (a) SPECT/CT sections of a NIS-transduced HC-transplanted liver, and (b) High-resolution SPECT imaging of individual regenerating nodules in 2 separate mice. White ovals highlight the individual nodule being followed . Delvaeye et al. used 99mTc-duramycin SPECT imaging  to characterize temporal and spatial kinetics of injury and cell death in susceptible tissues during TNF-induced systemic inflammatory response syndrome (see Figure 3). Duramycin is a natural antibiotic with 19-amino acids for imaging apoptotic and necrotic cells by binding phosphatidyethanolaminewith high affinity and specificity . The high spatial resolution and sensitivity of the U-SPECT/CT system combined with the high specificity of 99mTc-duramycin, enables whole-body assessment of tissue damage caused by inflammation and injury, as well as the early detection of tumor response to chemotherapy. Figure 3. Representative coronal SPECT/CT images of 99mTc-duramycin uptake in lung, liver, and kidney 6 h and 8 h after vehicle or TNF treatment . 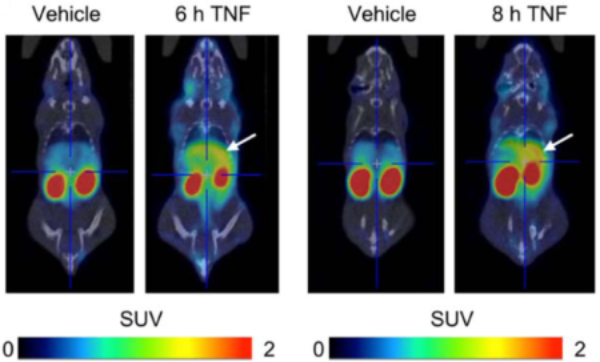 The regions with higher 99mTc-duramycin uptake upon TNF treatment, compared to vehicle, are indicated with a white arrow. Internal radiation therapy deploying Yttrium-90 (90Y) microspheres is increasingly being used in the management of patients with liver cancer. Bult, W et al. have now demonstrated that Holmium-166 acetylacetonate microspheres (166HoAcAcMS) may be an attractive alternative to 90Y because 166Ho emits both high-energy β-particles and gamma-rays, making it an attractive isotope for theranostic applications. Moreover, Holmium can be visualized by CT due to its high mass attenuation coefficient. The CT images can be used to ensure accurate delivery while the excellent emission characteristics of the β-particles and γ-rays combined with high-resolution U-SPECT/CT imaging leads to improved radiotherapy evaluation and follow-up. 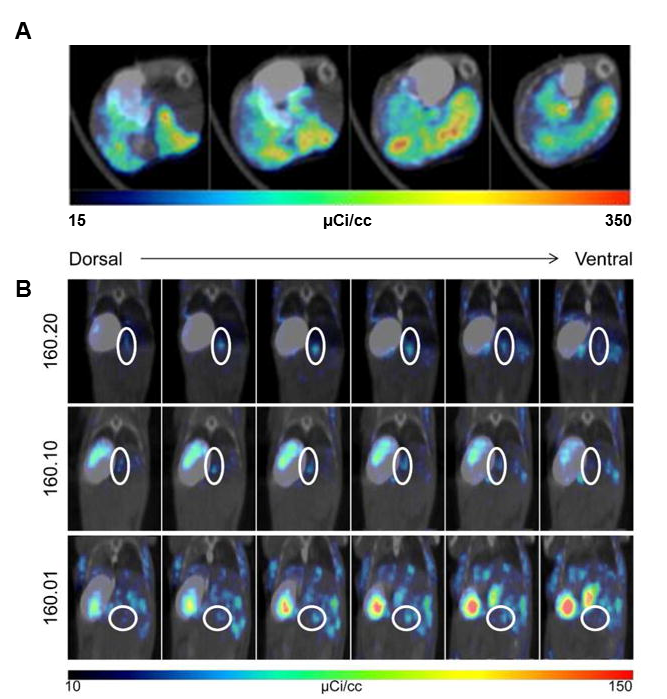 This demonstrates that166HoAcAcMS combined with ultra-high resolution SPECT/CT can be an elegant in vivomultimodality imaging solution for treatment guidance and monitoring of unresectable tumors in small animals. Research like this has resulted in clinical trials  and a spin-off company that markets registered therapeutic products. Many challenges in translational functional and molecular liver imaging can be solved by high-performance SPECT/CT systems with high sensitivity, high spatial- and temporal resolution. In conjunction with liver-specific biomarkers and reporters, this opens many opportunities for quantitative SPECT/CT imaging liver functions, such as transporter functionality, pathophysiological processes, response to therapies and tissue regeneration. Neyt S, Vliegen M, Verreet B, De Lombaerde S, Braeckman K, Vanhove C, Huisman MT, Dumolyn C, Kersemans K, Hulpia F, Van Calenbergh S, Mannens G, De Vos F. Synthesis, in vitro and in vivo small-animal SPECT evaluation of novel technetium labeled bile acid analogues to study (altered) hepatic transporter function. Nucl Med Biol. 2016;43(10):642-9. Neyt S, Huisman MT, Vanhove C, De Man H, Vliegen M, Moerman L, Dumolyn C, Mannens G, De Vos F. In vivo visualization and quantification of (Disturbed) Oatp-mediated hepatic uptake and Mrp2-mediated biliary excretion of 99mTc-mebrofenin in mice. J Nucl Med. 2013; 54:624-30. Hickey RD, Mao SA, Amiot B, Suksanpaisan L, Miller A, Nace R, Glorioso J, O’Connor MK, Peng KW, Ikeda Y, Russell SJ, Nyberg SL. Noninvasive 3-dimensional imaging of liver regeneration in a mouse model of hereditary tyrosinemia type 1 using the sodium iodide symporter gene. Liver Transpl.2015;21:442-53. Delvaeye T, Wyffels L, Deleye S, Lemeire K, Gonçalves A, Decrock E, Staelens S, Leybaert L, Vandenabeele P, Krysko D.Noninvasive whole-body imaging of phosphatidylethanolamine as a cell death marker using 99mTc-duramycin during TNF-induced SIRS. J Nucl Med. 2018 (in press). Bult, W. et al. (2013) Intratumoral Administration of Holmium-166 Acetylacetonate Microspheres: Antitumor Efficacy and Feasibility of Multimodality Imaging in Renal Cancer. PLoS One. 2013; 8(1):e52178. Smits NL, Nijsen JF, van den Bosch MA, Lam MG, Vente MA, Mali WP, van Het Schip AD, Zonnenberg BA. Holmium-166 radioembolisation in patients with unresectable, chemorefractory liver metastases (HEPAR trial): a phase 1, dose-escalation study. Lancet Oncology. 2012;13(10): 1025-34.